The combination of a long duration of wet weather and advanced growing degree days has created serious weed management challenges for many corn and soybean growers. Due to the impending June 20th cutoff date for approved dicamba formulations on Xtend soybean and weeds moving into their rapid growth phase, most of the questions I am receiving, and I hope to address, are focused on soybean. Prioritizing these fields is critical, because if you wish to achieve the maximum weed control potential for any of the postemergence herbicides, you need to target weeds at a 4-inch height or less. Therefore, full labeled rates and plant coverage are critical as tall weeds can shelter smaller weeds and contact herbicides such as Liberty, Flexstar and Cobra need higher gallon per acre rates and finer spray droplets than you would consider when using glyphosate or dicamba. Another challenge is keeping weeds under control in soybeans that are going to be late to canopy. This is especially true for common waterhemp, a weed that thrives on heat and moisture and has an emergence period that extends well into July. In this situation, a practice that has proven effective has been to apply a Group 15 herbicide such as Dual, Outlook, Warrant, or Zidua with either of the broad-spectrum herbicides, glyphosate or glufosinate that your seed technology allows (Figure 1). The article, Got waterhemp? 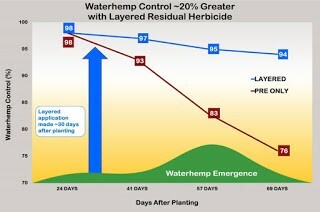 Layer residual herbicides to maintain control describes this layering strategy in more detail. While the Group 15 herbicides will not control emerged weeds, they will provide residual weed control later into July and allow the soybean canopy to develop and shade out some of the emerging weeds. To further complicate things, some fields have common waterhemp that are resistant to Glyphosate (Group 9); ALS inhibitors such as Pursuit, Classic, FirstRate (Group 2); PPO inhibitors such as Flexstar, Cobra, Cadet and Ultra Blazer (Group 14). Some plants have three-way resistance and some have two-way resistance. Using the Group 15 herbicides will help with the late flushes of weeds. Also, soybeans that have the LibertyLink trait are a good postemergence option as waterhemp biotypes have not yet developed resistance to the Liberty (Group 10) herbicide. I have received many responses indicating that the new dicamba formulations with Xtend seed technology is critical to common waterhemp management. Research from many land grant Universities indicates that dicamba is not a stand-alone herbicide and it does have activity on small weeds but it does not have effective residual soil activity. The key strength of the Xtend technology is with the earlier emerging weeds such as common lambsquarters and the ragweed species. Please note that even without the June 20th cutoff date for dicamba application, this technology should NOT be perceived as a rescue treatment for use in July. When it comes to postemergence weed control in July, the risk of crop injury, herbicide carryover, environmental and food safety (e.g. preharvest intervals) concerns all increase. Liz Stahl and Dave Nicolai recently published a Crop News article addressing growth stage cutoffs for herbicide applications in corn and soybean and how to determine growth stage and height (here). Also, I have published in cooperation with NDSU a chart listing crop rotation restrictions for many of the commonly used herbicides (Diversification strategies and crop rotations restrictions). Once the current herbicide resistant traits are in a weed population they do not go away. Therefore your next objective is to reduce their presence in the soil. If escaped weeds are allowed to produce seed, they have the potential to stick around for decades. Fortunately, for waterhemp, 90% of the viable seeds will be degraded in 4 years. Giant ragweed seeds are also degraded relatively quickly, with over 95% of the weed seeds being degraded in 2 years. Due to the increase in weed species resistant to multiple classes of herbicides it is becoming more and more evident that herbicides alone (either existing or new chemistry) cannot provide us with durable and sustainable weed management. Diversification of tactics, understanding weed biology and recognizing the agronomic impacts of our weed management decisions is necessary to address the changing weed landscape.